Collecting vintage items has always been more fun for me when they are actually things of a practical nature that I can use. One of those collections is my vintage hardware card and label holders. 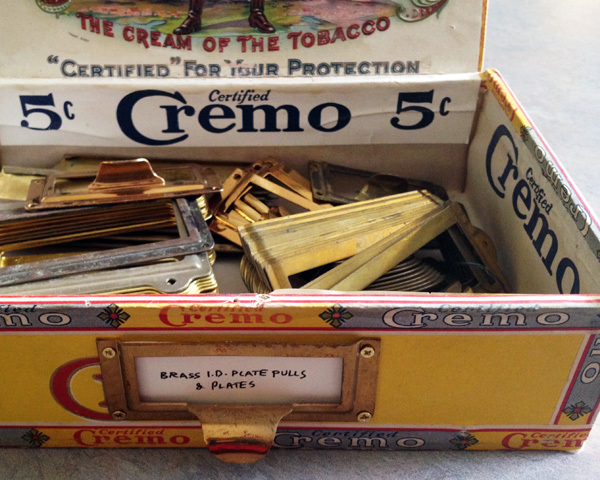 I wrote about finding and collecting them in my post at SC Johnson’s Family Economics, here. 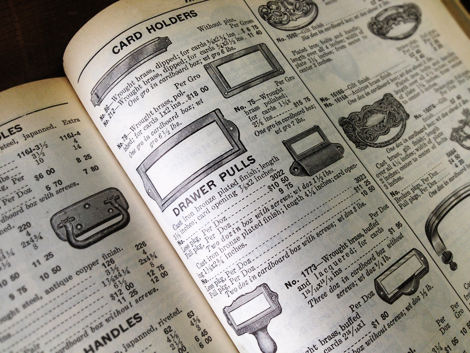 So while I was thinking and writing about my holders, I searched through an old hardware catalog that my dad gave me dated 1940 and found some great product illustrations. 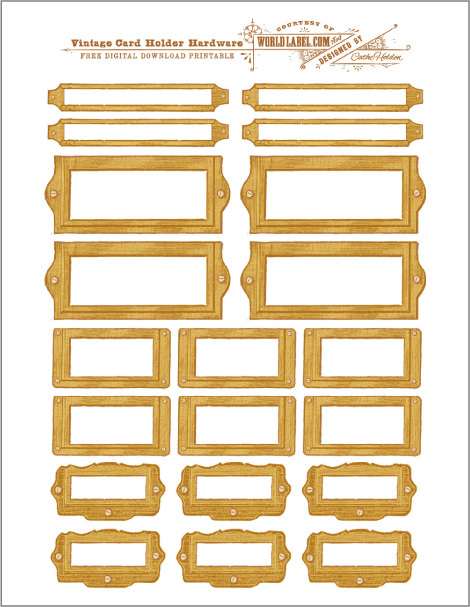 I scanned those illustrations and modified them complete with tiny screws into free label printables of faux card holders that you can download over at WorldLabel.com and print directly to their full sheet label stock. The kind folks at WorldLabel.com created text fields in the label files so you can type your own text in before you print. 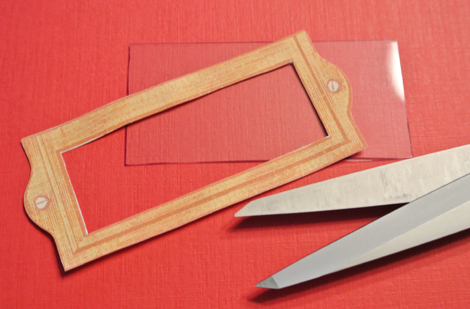 Create a window section by placing a piece of clear pvc plastic, new or cut from a section of product packaging, over a card holder frame, flush with the top of the edge of the hardware piece. 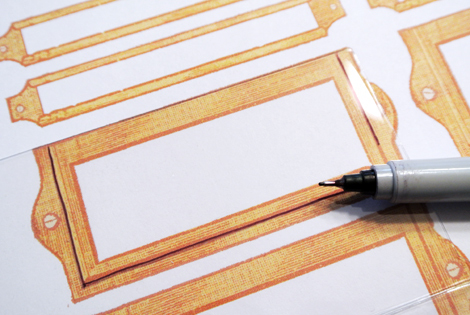 Trace a rectangle just outside the center area along the heavy folds in the frame illustration with a permanent marker. Trim out window section. 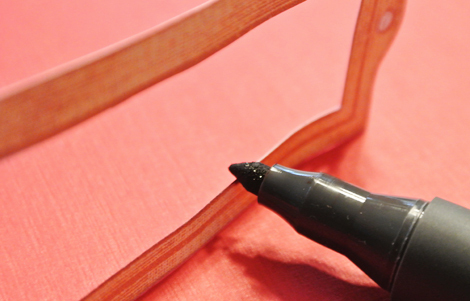 Use a brown marker to color the white cut edges of the label. Hold the frame backwards up to the light and draw circles where the screws are. 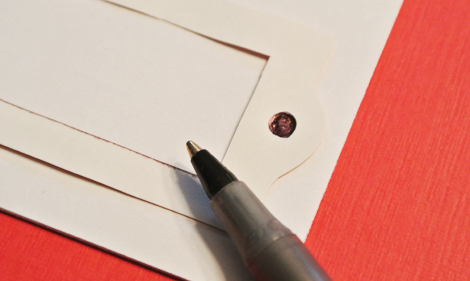 Lay the label upside down onto a stack of paper and with the pen, fill in the circle to create an embossing. 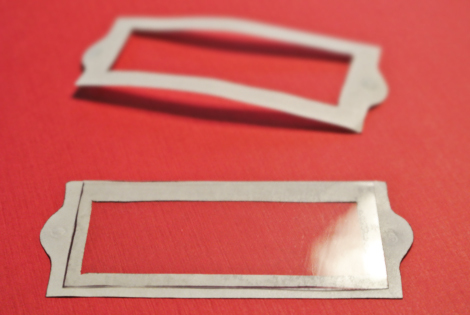 Remove the backing paper and attach the window plastic, flush with the top of the label. 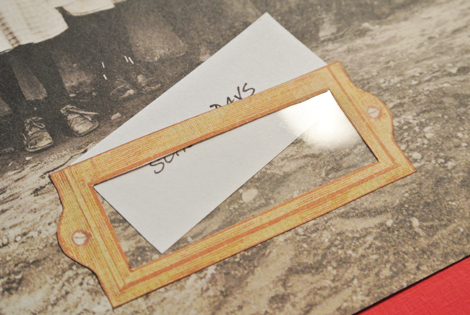 Place onto your final surface and slide a labeled card cut to size into the holder. 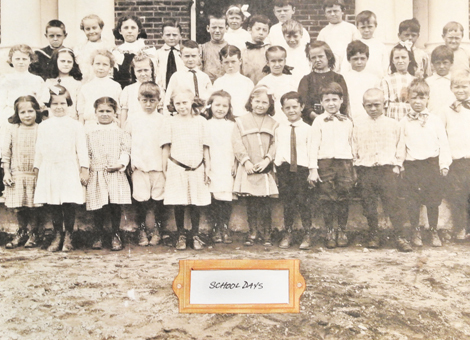 This darling 12″ x 12″ vintage class photo paper is from Jenni Bowlin’s JBS Mercantile. 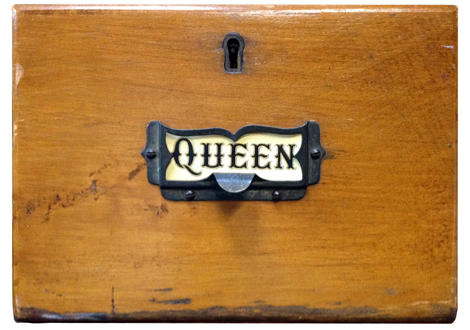 You can also photograph your own vintage hardware to use for labeling, or download mine for free here. And finally, here’s more freebies for you- images of one of my favorite card holders attached to the front of a card cabinet with a section of cigar labeling tucked inside. This entry was posted in Collecting, Family Economics, Free Clip Art, Free digital collage sheets, Free digital downloads, Free PDF files, free vintage art, organizing, Paper Crafts, Printables, SC Johnson, scrapbooking, Uncategorized, WorldLabel.com and tagged Family Economics, Jenni Bowlin, SC Johnson, WorldLabel.com. Bookmark the permalink. I love that you don’t just collect ephemera, but that you scan it and share it with us! 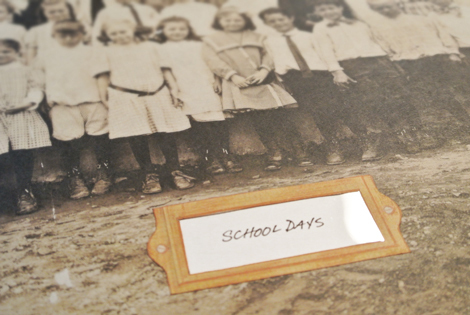 You are also preserving history this way! Thank you so much. Thank you so much for sharing this with us. I cannot wait to use them. OOOOH! That will really be fun to create. Thank you. I am loving spending time on your site today! Just found your comments graphics and can’t wait to install one on my sidebar. My followers are very silent and I hope it will make a difference. You are awesome and very talented. Thank you for sharing so much with the rest of us. Fantastic once again! Thanks for sharing with us. I love that idea! It gives everything such a rustic look, and doesn’t require a terrible about of skill either. Thanks for sharing! Cathe – you are AMAZING, I’ve visited many sites, admired many crafters but your site and ideas stopped me in my tracks. I just bookmarked your blog, I just love it. Thank you for sharing all the wonderful things you do. I’m excited to get started on a couple projects you shared, I’ve already pinned them on Pinterest. Happy Crafting! Thank you for generous kindness. Very nice! I’m wondering if you would be able to part with one of your brass label holder pulls, the one that is like the one on your cigar box in the picture. If you would, let me know, or let me know where I might get one. I have an old Weis file box, missing one label pull. Size is 2-3/4 x 1 1/4. Thank you for the wonderful treats! These are great I am trying to make labels for the sauces that are handmade and I think these will be a great boarder for them. Thank you!!! !